Tree Planting at Troutbeck Park Farm. An ancient and historic land management system where livestock grazed amongst trees grown for timber. These open grasslands with their interspersed mature and ancient trees are ecologically important, as well as being visually attractive landscapes. A long term benefit of livestock, especially cows, feeding, trampling and fertilising the ground, has created a species rich habitat. 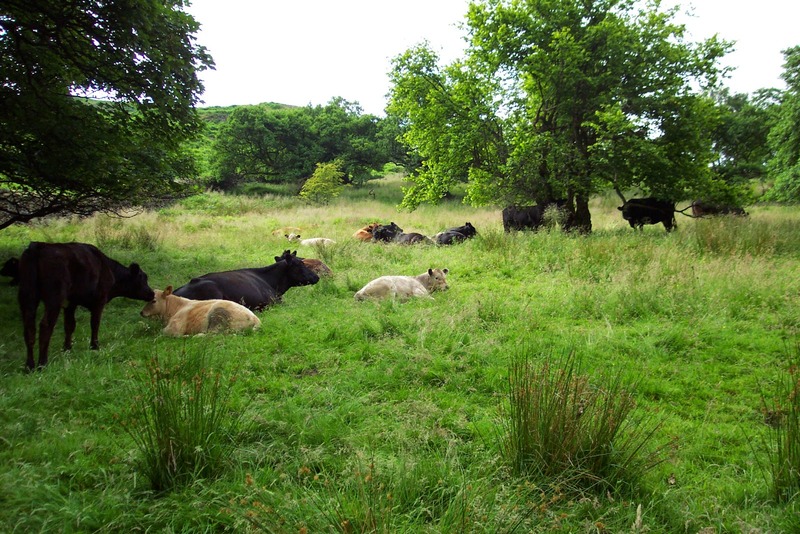 See Woodland Ranger Ben Knipe's post "Trees + Cows = Wood Pasture," for more details. Cattle grazing beneath the veteran trees at Glenamara Park, Ullswater. Image © Steve Dowson, Area Ranger. Ullswater. See post "Glenamara Park." Nowadays, careful management is required to keep wood pastures at their best by pollarding the old trees to extend their life span, cattle grazing, encouraging natural regeneration, and planting and protecting saplings which will eventually take the place of the existing old trees. The National Trust has, in partnership with the tenant farmer, embarked on a major long term project to improve the wood pasture at Troutbeck Park Farm. The work is grant aided by Natural England through the Higher Level Stewardship scheme. Part of the project work involves tree planting and constructing tree pens to protect them during the early years. Fell rangers and countryside Central and East Lakes rangers carrying the materials for constructing "tree pens" up the slopes surrounding Troutbeck Park Farm. Back for more materials...... in Red Arrow formation. The tree pen taking shape. Simone Backhouse, a local police officer, was keen for local schools to assist the National Trust, on a regular basis, in caring for Millerground. The following post is just one example of this. On Thursday afternoon, the 3rd of April, students from Windermere School, together with members of the Windermere and Bowness Civic Society, and members of the South Lakeland District Council met up with National Trust Rangers at Millerground. The Two hours of work involved pulling out, and cutting back brambles on the slope above the footpath in preparation for the planting of 2200 bluebells, donated by the Windermere and Bowness Civic Society. This image shows a small area of the bramble choked slope to be tackled. Two trips were needed for the National Trust Land-rover and trailer to remove all the bags. An excellent afternoon's work by everyone involved. The following weekend the bluebells were planted by the Windermere and Bowness Civic Society. Through the hedge to Bridge House. Fiona Green, House Steward at Townend, has taken on the running of 17th century Bridge House; it was reopened to the public on Thursday the third of April. One of Fiona's ideas was to cut a way through the beech hedge that borders the area behind Bridge House and make a new entrance; this would be a good alternative to the narrow roadside pavement access. With everyone happy with the proposal, the work went ahead, and was completed before Bridge House reopened. A tree stump needed to be dug out. Taking away the cut back beech. with crushed stone from Elterwater Quarry. and the areas in front of the memorial benches. car park, or to the shops and restaurant located nearby.